Under the microscope: mycorrhizae on plant root. 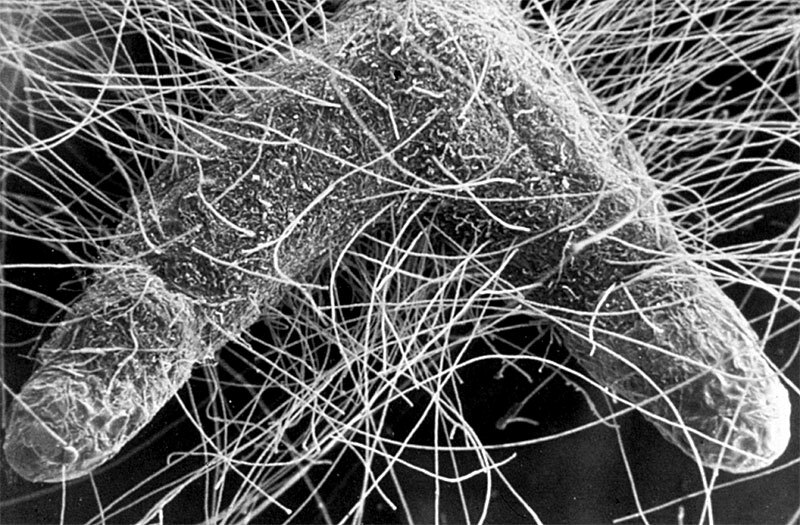 Mycorrhizal fungi are beneficial microorganisms closely associated with the roots of most plants. These fungi enable plants to absorb more nutrients (such as phosphorus, zinc, and copper) from many soils than do corresponding non-mycorrhizae plants. 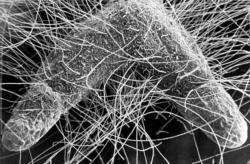 Water uptake may also be increased by mycorrhizal fungi. In this way, mycorrhizal fungi increase the efficiency of fertilization. Mycorrhizal fungi naturally exist in largest amounts in healthy, uncultivated soils in the coarse organic matter near the soil surface. That means if the soil has been tilled, the topsoil has been removed, erosion has occurred, or the soil has been solarized, then some of the mycorrhizae has been removed or killed. There should still be some native mycorrhizae in garden soils that have been tilled; however, if the soils have undergone extreme modification, such as activities associated with construction (removal of topsoil or compaction caused by heavy equipment), inhospitable oxygen-depleted soils are created and mycorrhizal fungi suffer, and adding mycorrhizae may be necessary under these conditions. 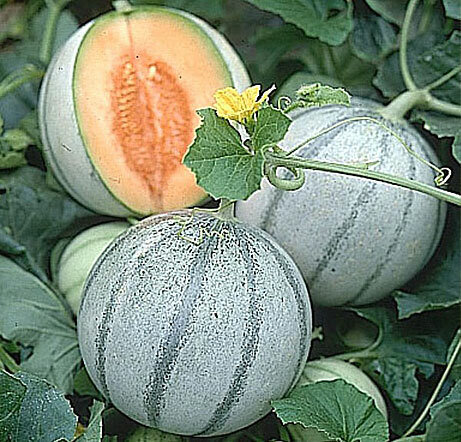 The test: For the months of May through August, 2013, we tested mycorrhizal fungi on melons in the FOHC vegetable garden. Six plants each of six different varieties were grown, half (three plants of each variety) had their roots dusted with mycorrhizal fungi at time of transplanting on May 1st. The experiment was to determine if added mycorrhizae helps increase fruit yield, fruit size, and foliage growth. 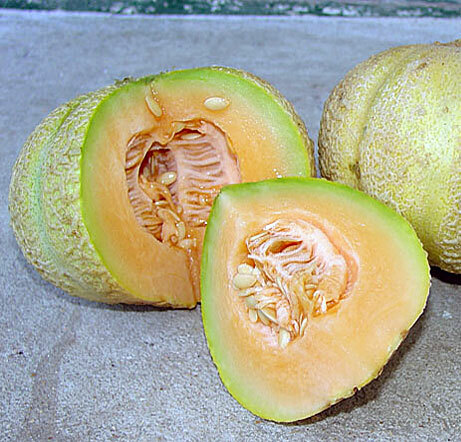 The six varieties that were grown (a mix of hybrids and open pollinated/heirlooms) were: Ambrosia, Arava, Golden Jenny, Haogen, Retato Degli Ortolani, and Savor. 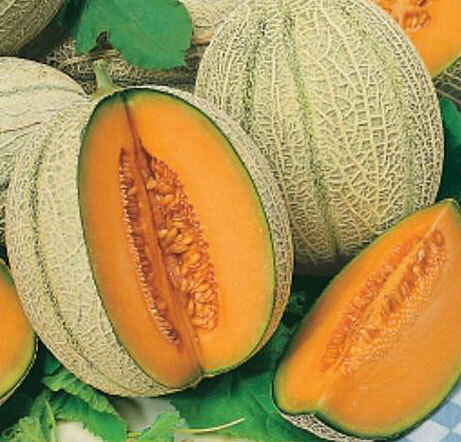 In our experiment, several of the melon plants treated with mycorrhizal fungi initially grew faster, and in some cases were substantially larger, than the melon plants that were not treated. Root samples were taken in mid-July and were tested to see how many mycorrhizae had colonized on the roots. Typically, plants would naturally have about 5 percent mycorrhizae on their roots, compared to about 20 to 30 percent on treated plants. We were somewhat surprised to learn that there was only 5 percent mycorrhizae colonization on the roots of treated plants and 6 percent mycorrhizae colonization on the untreated melon roots. 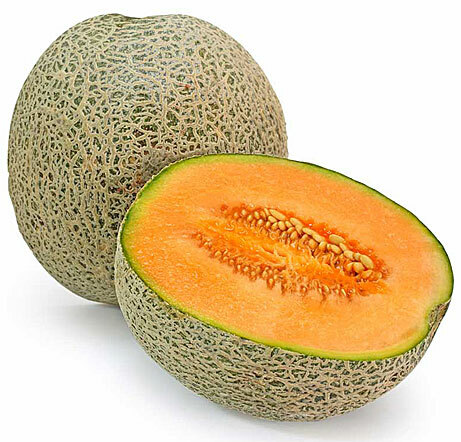 Harvest: As of the end of August when the plants were removed, we harvested a total of 234 melons from the 36 plants (total weight of the melons was almost 528 pounds). 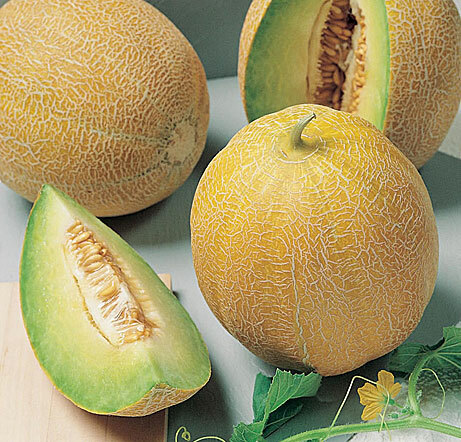 The total yield was slightly higher with the varieties treated with mycorrhizae (121 melons vs. 113 melons from plants not treated), and the total weight was higher with all treated varieties. 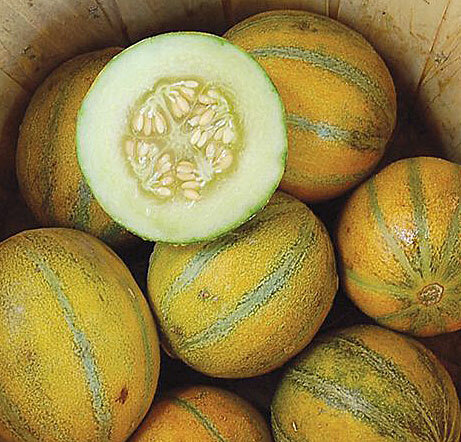 The average weights of individual melons in most cases were slightly higher with the treated varieties. A summary of the harvest results appears in the table below. 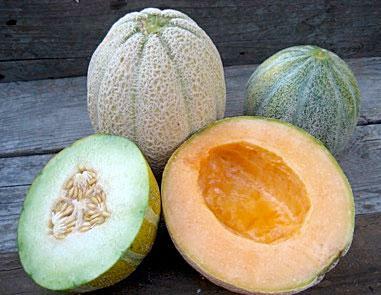 Sacramento County Farm Advisor Chuck Ingels ran statistics to determine if there was a significant difference in total weight between the melons treated with mycorrhizae and those that were untreated. He determined that there was no significant difference at the standard 5 percent level. The bottom line: The additional mycorrhizae did not have much benefit, perhaps because the biological activity and fertility of the soil in our raised beds is already so good due to regular additions of compost. It could help in gardens with poor soils, but because this was not a truly replicated study, we do not know for sure. This was a preliminary test, and it would need to be repeated several times in order to gain significant information. It was a very interesting experiment and definitely worth the effort. Ambrosia (with mycorrhizae) 23 84 lbs. 0 oz. 3 lbs. 10½ oz. Ambrosia (without mycorrhizae) 25 81 lbs. 10 oz. 3 lbs. 4 oz. Arava (with mycorrhizae) 12 39 lbs. 13 oz. 3 lbs. 5 oz. Arava (without mycorrhizae) 14 29 lbs. 3 oz. 2 lbs. 1 oz. Golden Jenny (with mycorrhizae) 31 39 lbs. 7 oz. 1 lb. 4 oz. Golden Jenny (without mycorrhizae) 23 28 lbs. 13 oz. 1 lb. 4 oz. Haogen (with mycorrhizae) 16 29 lbs. 7 oz. 1 lb. 13½ oz. Haogen (without mycorrhizae) 20 35 lbs. 15 oz 1 lb. 12¾ oz. Retato Degli Ortolani (with mycorrhizae) 20 55 lbs. 4 oz. 2 lbs. 12 oz. Retato Degli Ortolani (without mycorrhizae) 16 42 lbs. 5 oz. 2 lbs. 10 oz. Savor (with mycorrhizae) 19 36 lbs. 5 oz. 1 lb. 14½ oz. Savor (without mycorrhizae) 15 25 lbs. 11 oz. 1 lb. 11¼ oz. Ambrosia (without mycorrhizae) - 6 lbs. 9 oz. Ambrosia (without mycorrhizae) - 6 lbs. 4 oz. June 23, 2017. Written by Gail Pothour, UCCE Master Gardener of Sacramento County.